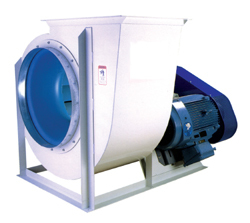 The BC/BAF series of fans are designed to provide very efficient, non-overloading operation over a wide airflow range. The BC is a backwardly inclined flat blade design. Applications include dust collectors, dryers, aeration of products or applications where the airstream contains minor contamination. The BAF is a premium effecient airfoil fan design. BAF fans are excellent for clean air applications such as dehydrating and ventilation.